Point and click map icons to access most recent sampling data. Upon issuance of said permit, a number will be assigned to each residential Dock. These numbers shall be no smaller than three (3) inches high and shall be affixed to the residential Dock as to be easily visible from the water. If ownership of a residential Dock is sold or transferred, the new owner must apply for a new permit and notify the Office of Ecosystems Management within fourteen (14) days after property transfer is complete or remove the facility and restore the use area within thirty days (30) after ownership transfer. The application process to transfer an existing residential Dock shall be the same for requesting a permit for a new Dock; however, the applicant need not have a new survey completed if (i) an old survey clearly indicates the GRDA taking line or (ii) the legal description of a previous owner’s deed of conveyance uses the GRDA taking line as a point of reference. GRDA reserves the right to require a new survey, if justified by the circumstances. Characteristics, zoning and prevailing permitted uses within a half-mile radius of the proposed activity. Safety, navigation and flood control requirements. Environmental impacts. Potential economic development and tourism benefits. Statutory mandates (82 O.S. 861 et seq.). If the permit holder fails to comply with applicable laws, rules or regulations or ceases to use, operate or maintain a permitted facility, the Office of Ecosystems Management may revoke the permit and cause the facility to be removed by contract or otherwise, and the permit holder agrees to pay all costs incurred thereof. Safety around its hydroelectric facilities is a top priority for the Grand River Dam Authority. Signs, buoys, sirens, fencing and flashing lights are all intended to notify those in the area when floodgates are open, generators are operating or water is rising swiftly. Posted at GRDA hydroelectric facility (Pensacola Dam, Robert S. Kerr Dam, and the Salina Pumped Storage Project) to warn of extreme danger in floodgate areas. Please be aware of other signs near GRDA facilities that notify you of no trespassing areas, no diving areas, or unstable footing. Red buoys and cabling above and below spillway gates and hydroelectric powerhouse restrict access to dangerous areas associated with power generation or floodgate releases. At hydroelectric facilities, the flashing lights are initiated when floodgates are opened or generation is initiated. In place to identify borders and to restrict access to certain areas near the hydroelectric facilities. These are located at various locations on the hydroelectric facilities and are utilized prior to the operation of hydroelectric generators and/or floodgates. As navigational aids, several lighthouses are located on Grand Lake, around the shoreline and in areas of shallow water. The Grand River Dam Authority has an ongoing maintenance program in place to ensure the lighthouses are functioning properly. In 1992, the Federal Energy Regulatory Commission (FERC) issued the Grand River Dam Authority a new license to operate the Pensacola Dam and Grand Lake. In 1996, an amendment to that license required GRDA to begin holding Grand Lake at different elevations throughout the year. In early August, this license requires GRDA to begin lowering the elevation of Grand Lake to meet a 741’ mark by September 1. The lake is then held at this elevation until mid-October, when GRDA is required to begin raising the elevation to 742’ by month’s end. The license then calls for the lake to be held at 742’ through the winter and spring months, before GRDA begins raising it to meet a 744’ mark on June 1. It is then held at this elevation again, until August 1. 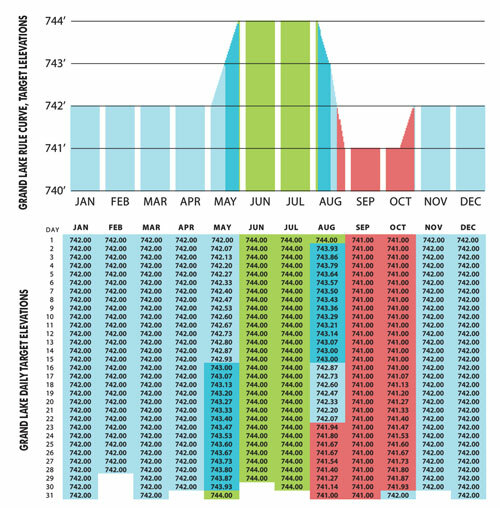 The accompanying graphics illustrate the elevation requirements and schedule mandated by GRDA’s operating license for Pensacola Dam/Grand Lake, as issued by FERC. Langley – In the two weeks since the Grand River Dam Authority removed its “no bodily contact” warning for Grand Lake waters (originally issued because of Blue Green Algae) water conditions have continued to improve greatly. That is the word from the GRDA Ecosystems Management Department. The department has continued monitoring and testing efforts since the Blue Green Algae (BGA) outbreak was confirmed in late June. On July 13, after testing showed a significant decrease in BGA toxin levels, GRDA removed all its warnings against bodily contact with lake waters. “At this point, we are simply asking the public to remain vigilant and avoid areas of the water where BGA scums appear to be present,” said Townsend. For more information on BGA, and other lake safety information, visit grda.com. 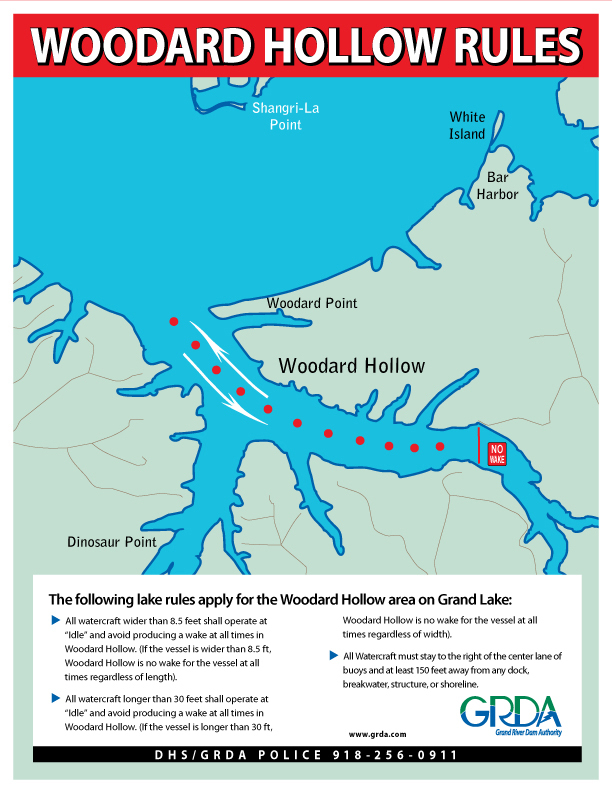 Chandler – The latest Grand Lake water samples — showing a significant decrease in blue green algae (BGA) toxicity — have prompted the Grand River Dam Authority to remove its “no bodily contact” warning for Grand Lake waters. Rather, the public is now simply encouraged to use caution in the water and avoid body contact with areas of visible BGA accumulations and “scum.” Meanwhile, GRDA continues to encourage the public to enjoy all activities in the Grand Lake area. GRDA made the decision to remove the warning following an update from GRDA staff at the July 13 board meeting in Chandler. In his report to the board on July 13, Townsend said samples taken earlier this week showed the decrease, which may indicate the algae is dying off. However, he said, GRDA will continue its daily monitoring and sampling efforts, as long as conditions warrant. If conditions do change, GRDA will notify the public. For more information on BGA, visit grda.com or Department of Environmental Quality. While the most recent results from water sample testing in Grand Lake has shown a significant decrease in levels of blue green algae (BGA) toxins, the Grand River Dam Authority continues to warn against recreational activities that involve bodily contact with Grand Lake waters. Those results are from water samples gathered in both the Duck Creek and Horse Creek areas of Grand Lake. According to the GRDA Ecosystems Management Department, that demonstrates a real improvement in the BGA outbreak, however the BGA scums (visible accumulations) found throughout areas around the lake continue to be prevalent and toxic, and need to be avoided. Though the public is still very much encouraged to enjoy activities in the Grand Lake area, avoidance of bodily contact with Grand Lake waters is still in the public’s best interest. GRDA will continue its daily monitoring and sampling efforts indefinitely, as long as conditions warrant. Additional information on BGA can be found by following the links on this website, or by visiting the BGA link to the Center for Disease Control and Prevention.